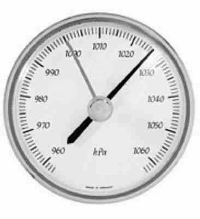 Due to decreased/increased air pressure with increased/decreased altitude the reading of barometric pressures at other elevations than sea level must be compensated. Ben Nevis in Scotland is 1344 m high. A barometer at this elevation must be added approximately 151 mBar to compensate for the difference in pressure from sea level. Engineering ToolBox, (2012). Barometer - Compensation for Altitude. [online] Available at: https://www.engineeringtoolbox.com/barometers-elevation-compensation-d_1812.html [Accessed Day Mo. Year].